Splash! Drag! The fight was on! Well, after deliberating with several guides and getting a different answer from each one, I decided to go find my own fish. After two uneventful sets, we witnessed large swirls tight to the shoreline. 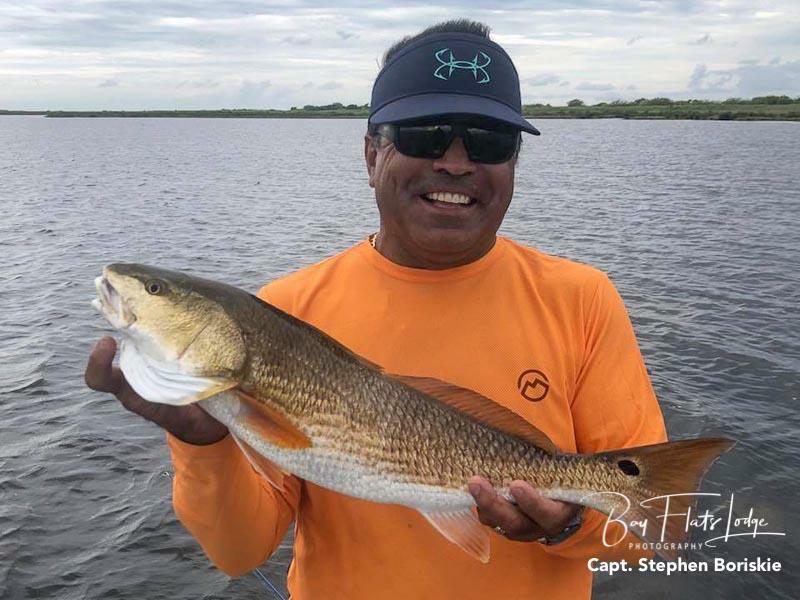 The redfish action was non-stop for almost 2-hours while experiencing immediate hook sets just as soon as the shrimp hit the water. My fishing partners today were our granddaughter, Briley, and our daughter, Stacy. Deb and I really never had a chance to fish, as we were too busy helping. Stacy came out on top with her landing 15 reds, while Briley landed 11. We kept enough for tonight’s dinner and released the rest. I hope you enjoy the video as much as we enjoyed the fishing! Capt. 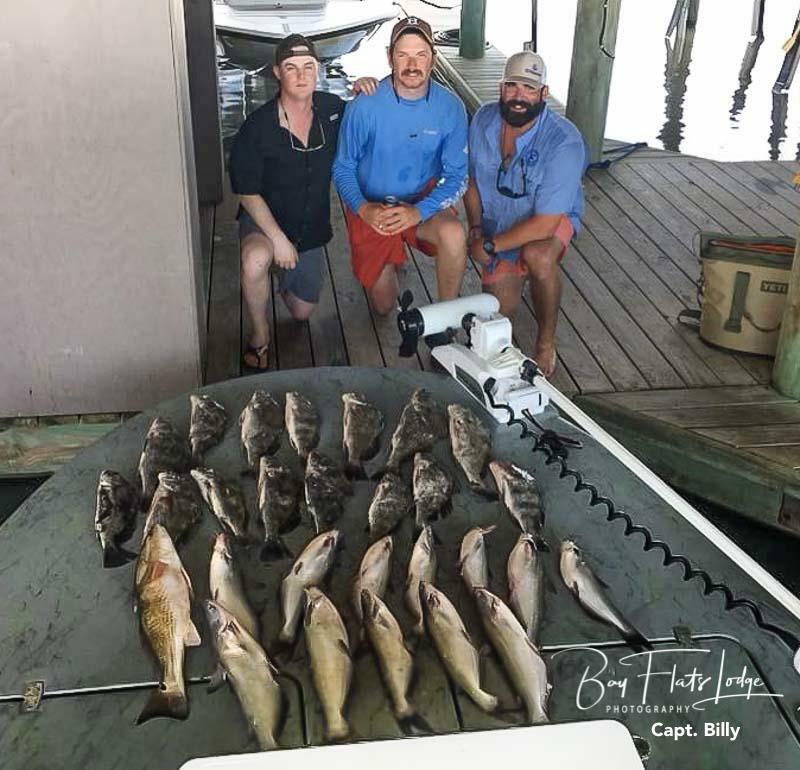 ‘Lil John Wyatt – This was Day #2 with the McCoy’s group, and they had a really good day on the water. 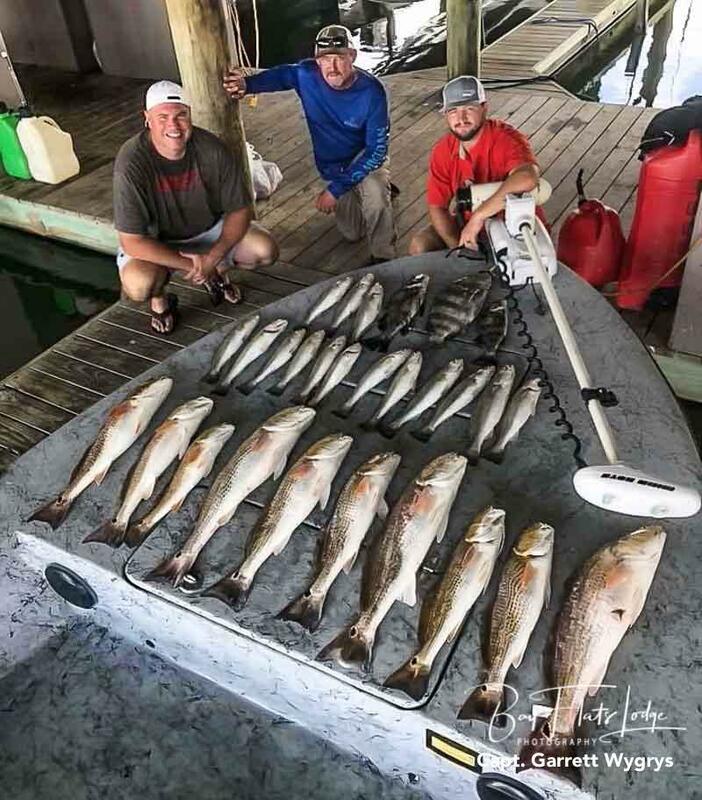 They managed full limits of speckled trout, as well as seven very nice slot-size redfish. It turned out being a good day at the office for this crew! Capt. Stephen Boriskie – Another good day of fishing with the boys, and while the fish eluded us we didn’t wait long before chasing after them. We started out doing what had worked on Wednesday, but around here “yesterday” is about as reliable as tomorrow! So, of course it didn’t work! Going back to what worked a couple weeks ago, I found some fresh mullet that were willing to come along. We gave ’em a good try and ended up with two beautiful Redfish before time caught up to us. Lending a hand to a customer shuttle, we helped bring a couple anglers in off a boat in distress. The cool thing about that was there were three of our guide boats helping one downed boat – all of us keeping the guests safe, and on time back to the dock. It’s just another example of the teamwork we are dedicated to around these parts. 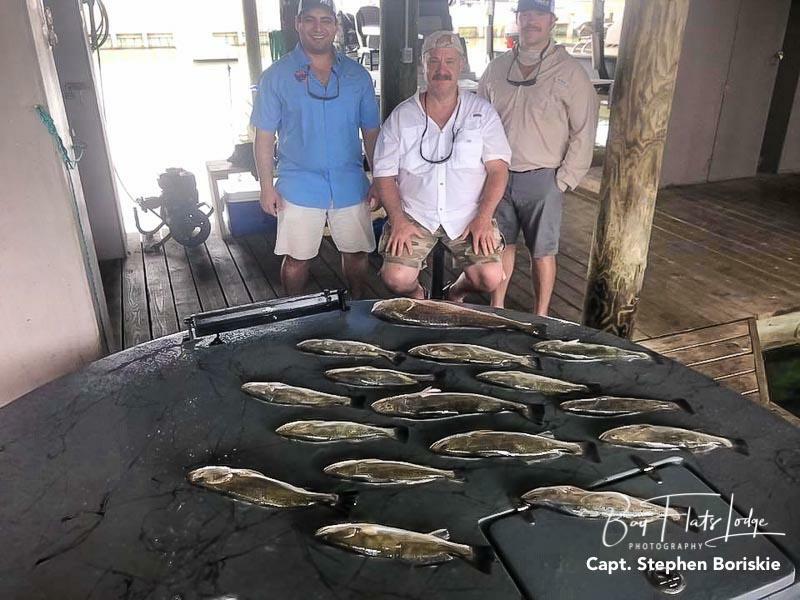 So, all these clients smoked the Redfish yesterday, and persevered today with a smaller box, but it turned out being a much better story of the typical team building adventures at Bay Flats Lodge. Capt. Todd Jones – Tough sleddin’ the last few days. Brandan and David were up for the challenge, and scratched out their limit of reds up to 25-inches. It was David’s first saltwater trip, so he’s off to a good start. I think the highlight of their trip might have been watching the little gator play with a cork! It was a lot of fun watching them catch fish! Capt. Billy Freudensprung – A wise man once said, “If it ain’t blowing, we ain’t going”. Well, we went today and it was blowing! Blowing those fish against the shoreline kept Jeremy and Paul busy. 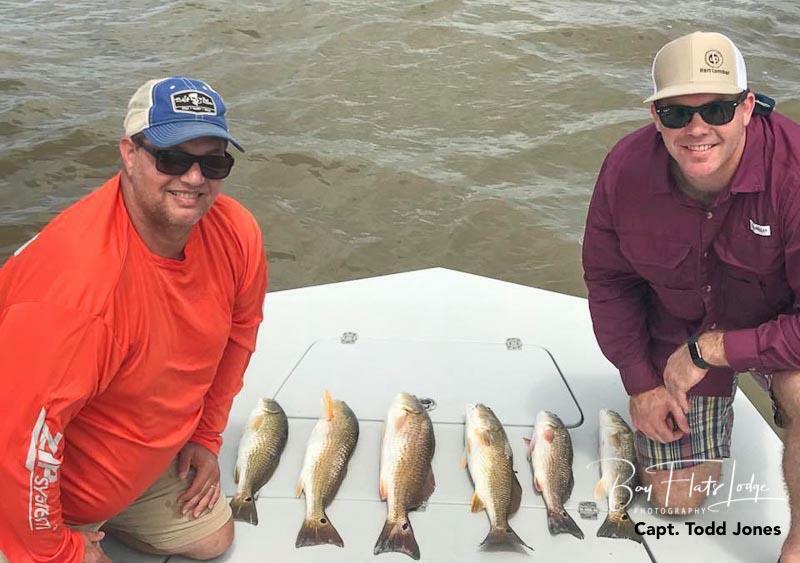 They managed their redfish limits and chased a few extra nice-sized drum to top things off! Today turned out positive for these two! Capt. ‘Lil John Wyatt – Great day today with these guys! They had limits of reds and drum, to include several oversize reds that were released back into the bay to fight another day. The redfish action has been consistent lately, but the trout are making a slow appearance once again. Some of the guides have gotten into some good ones the last couple days – just another fun item to look forward to as things begin to cool off more around here! Stay tuned to the latest action! Capt. 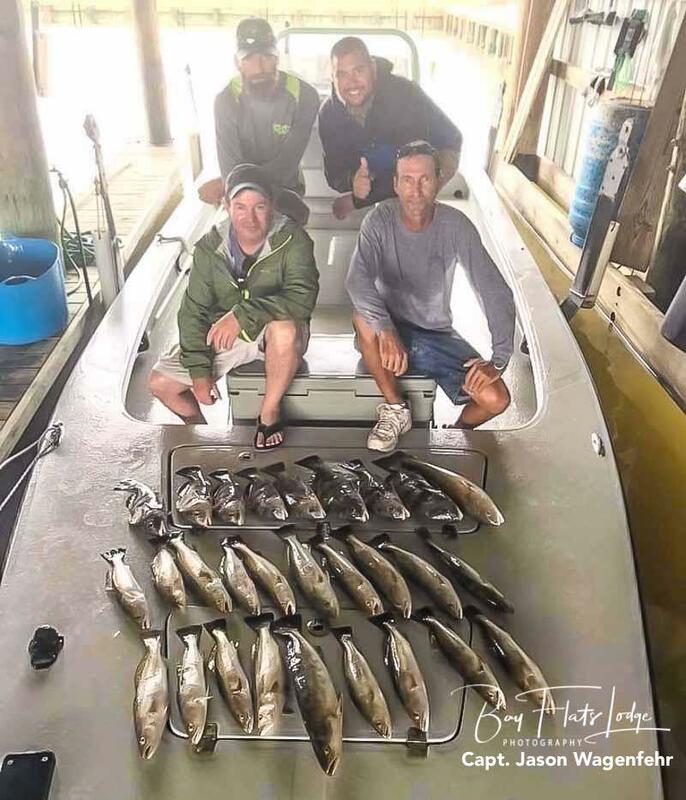 Kevin Matula – It wasn’t easy just getting out in the strong winds this morning, but we got out there! These guys stuck with it to the absolute end in an effort to bend some rods. They did alright considering today’s conditions! Capt. 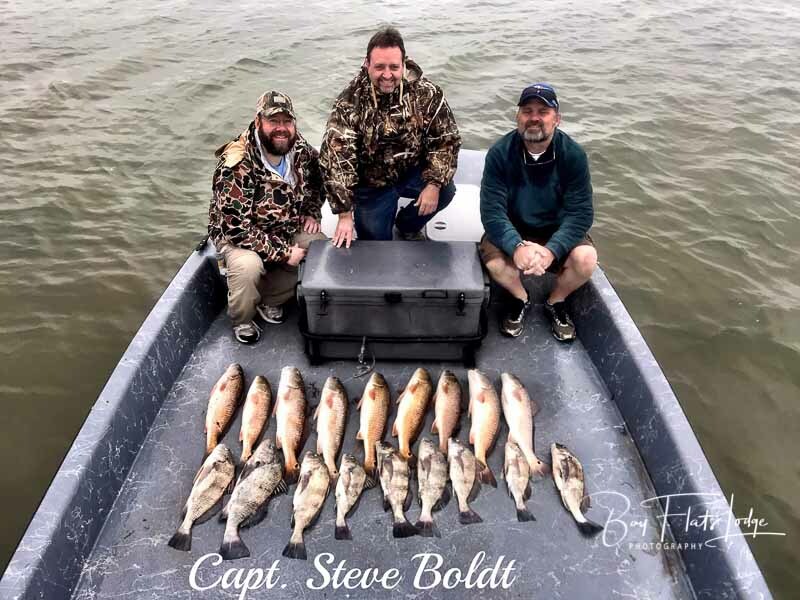 Steve Boldt – I wasn’t too sure about what sort of outcome we were going to have when we first started out this morning, because we didn’t hit upon the redfish bite like we have been doing quite regularly the past couple weeks. 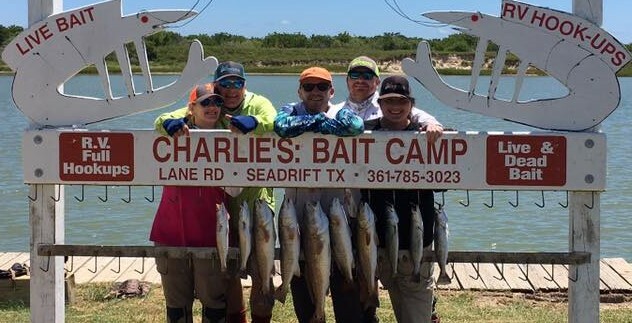 At least the trout cooperated, and they even allowed one of my guys a Texas slam – trout, red, and flounder! Capt. Jason Wagenfehr – Thursday we had to duck and dodge a few storms, but we got lucky and landed on some fish. My thanks go out to Capt. 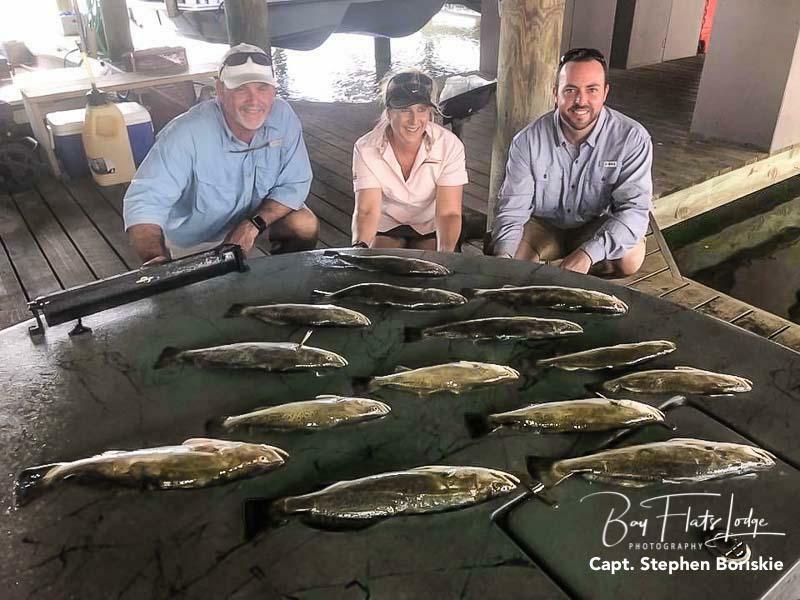 Todd Jones for the use of his boat while he was on vacation – it seems to attract fish rather nicely! 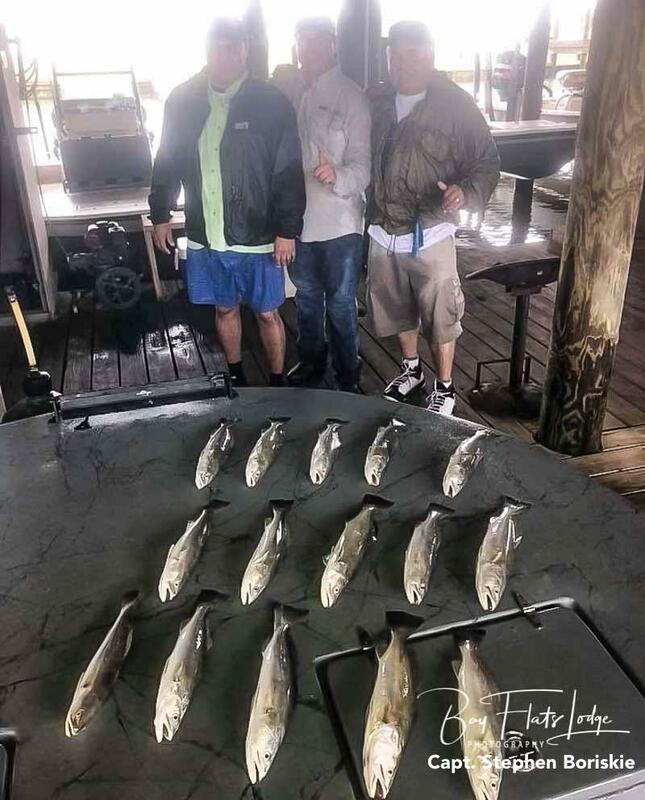 – We beat the rest of today’s deluge by limiting out on Speckled Trout early and then calling it a day just in time to once again get the customers under cover from today’s multiple rain storms. Unfortunately, things are probably going to be like this for a while. The next few days will be all about patience and timing until this tropical moisture dries up! Capt. Billy Freudensprung – I had a good day with these guys! We looked for the trout and the reds, and we found a couple here and there, but the guys wanted to experience some steady action. 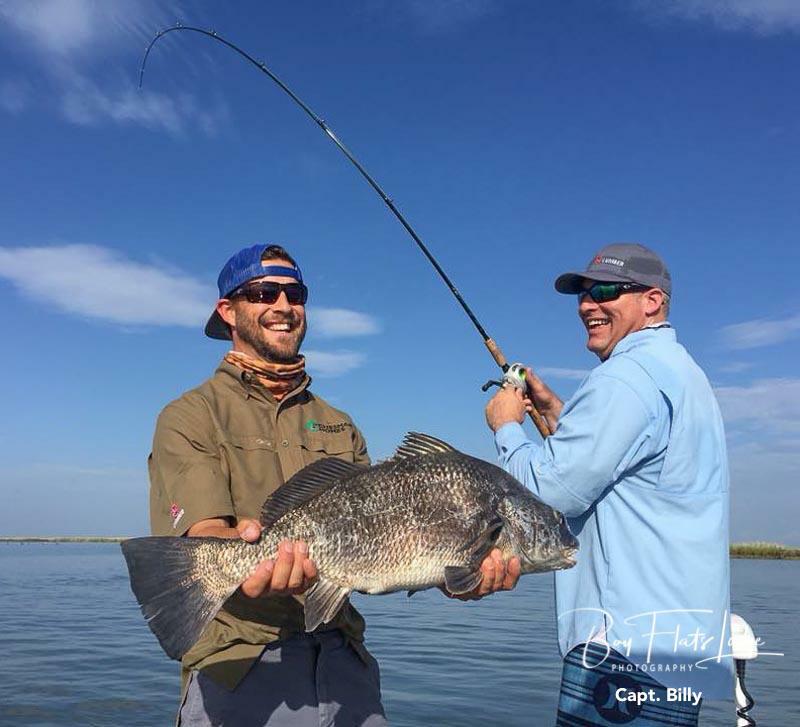 They wanted a bigger pull, so we chased a big school of black drum for some rapid C-P-R action. It was a lot of fun for everyone! Capt. 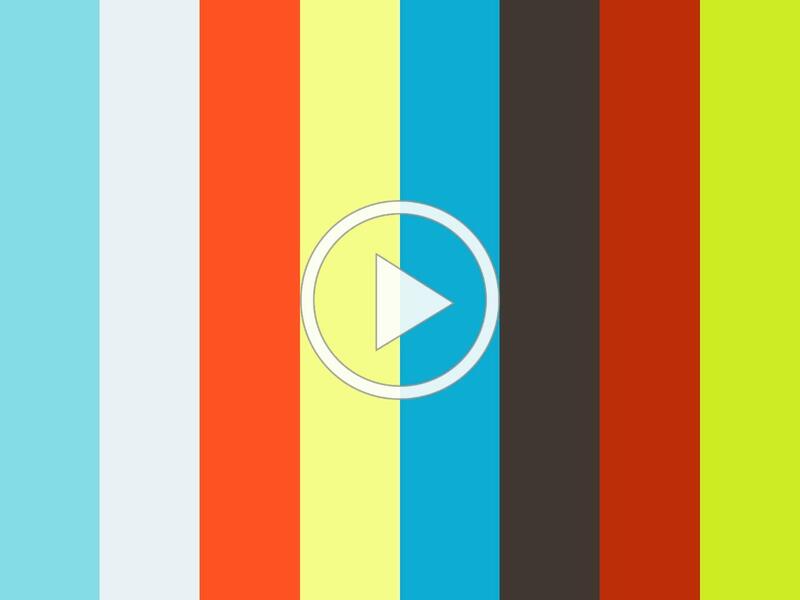 Garrett Wygrys – Today was an all around amazing day! My crew set their minds to doing their very best, and that’s exactly what they did. 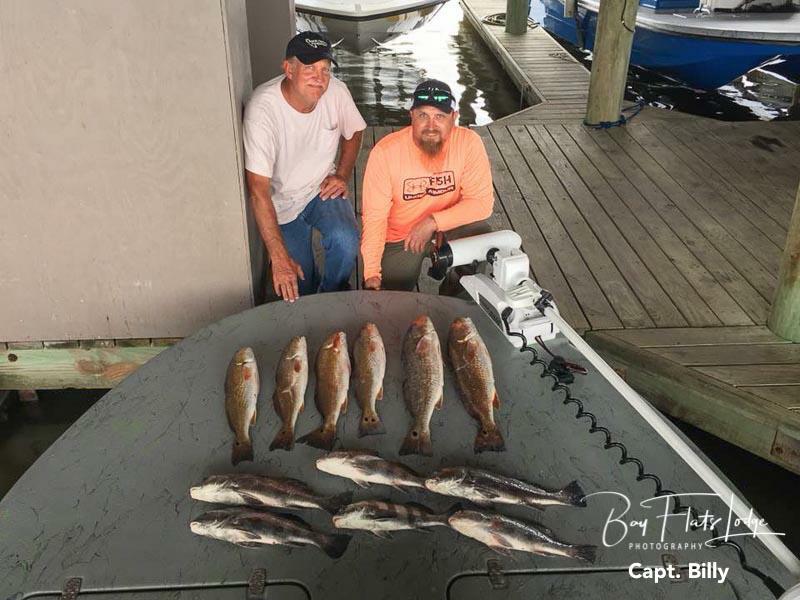 They managed their three-man limit of Speckled Trout, as well as Redfish (to include one tagged Red). 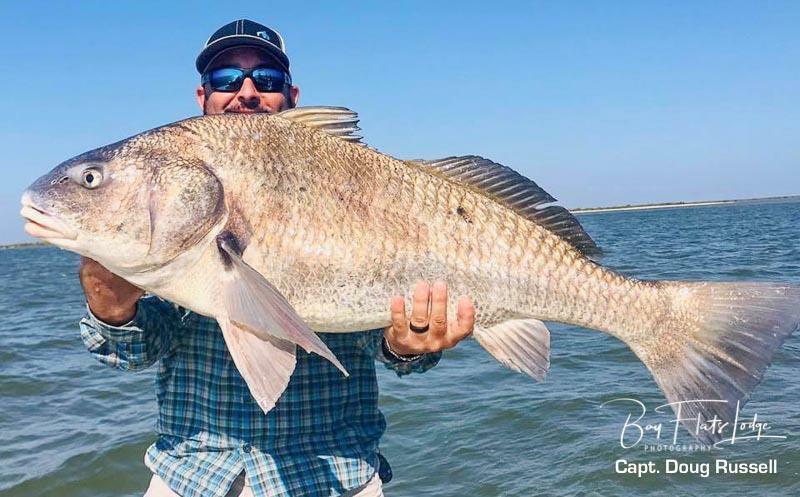 They topped things off by landing a few Black Drum – it was just icing on the cake! Capt. 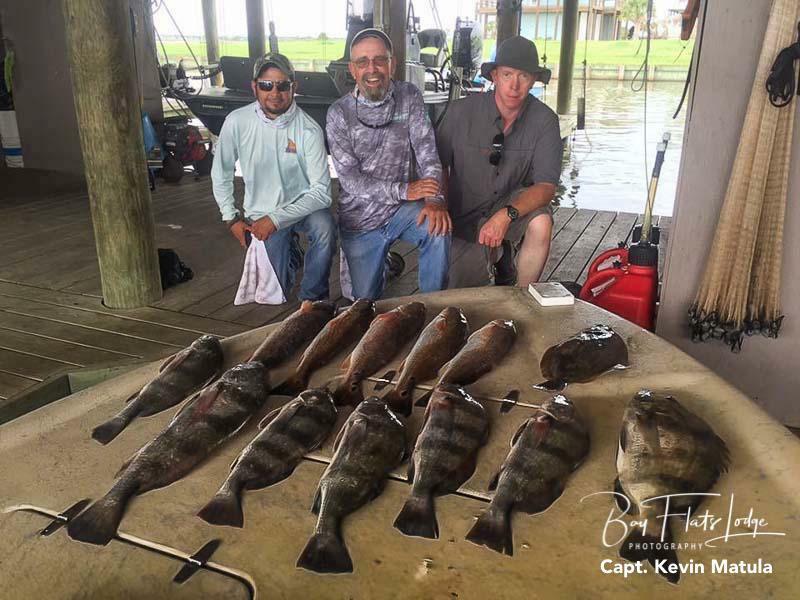 Billy Freudensprung – I had another Black Drum kind of day with today’s party, with a Redfish and some cats thrown in the mix. 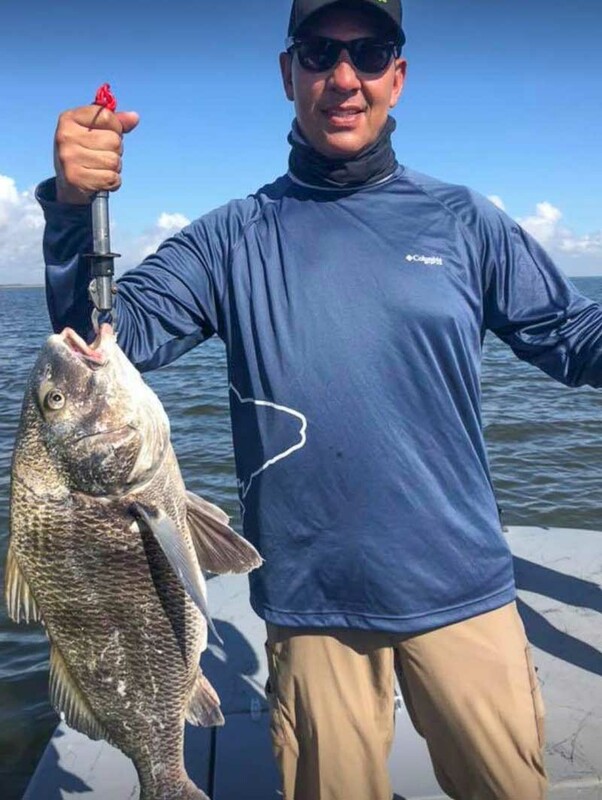 The trout bite just never materialized for us this morning, but the Black Drum were plentiful, which has been the case for the past few weeks now. We saw a nice Red and some cats, which filled the trout gap accordingly, but it would sure be nice to get back into the big trout circle once again. 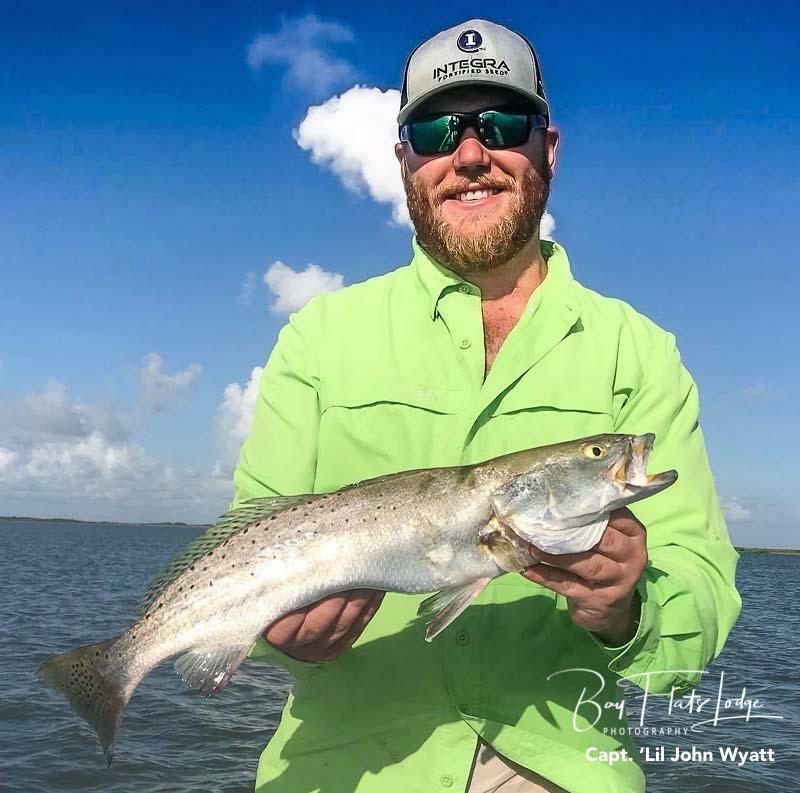 Once this weather blows through, and when things cool off a bit toward the end of the month, we will see some good Speckled Trout and exceptional Redfish action on a much more regular basis each day. Capt. ‘Lil John Wyatt – Great day on Saturday with the bachelor party that was part of the Vincent G. group. We actually experienced a rather nice Speckled Trout bite today, landing some of the finest trout I’ve seen all week long. The Redfish also graced us with their presence, and a couple of guys caught some nice ones. The guys had an absolute blast, with lots of fish boxed that led to everyone having a great time! Capt. Todd Jones – Back in the saddle after a two-week hiatus, and a much needed vacation. Knocked the rust off on a half-day morning trip with a group of contractors from the Houston area. The trout bite was a little slow for us, but the guys boxed eight solid fish for their efforts. A quick lunch and we were back out again for the afternoon trip. A change of strategy and location kept the guys busy with non-stop action, ending the day with their limits of reds to 27″ and some solid drum to 22″. Half-day on Sunday morning coming up with this group – hope their luck holds out! 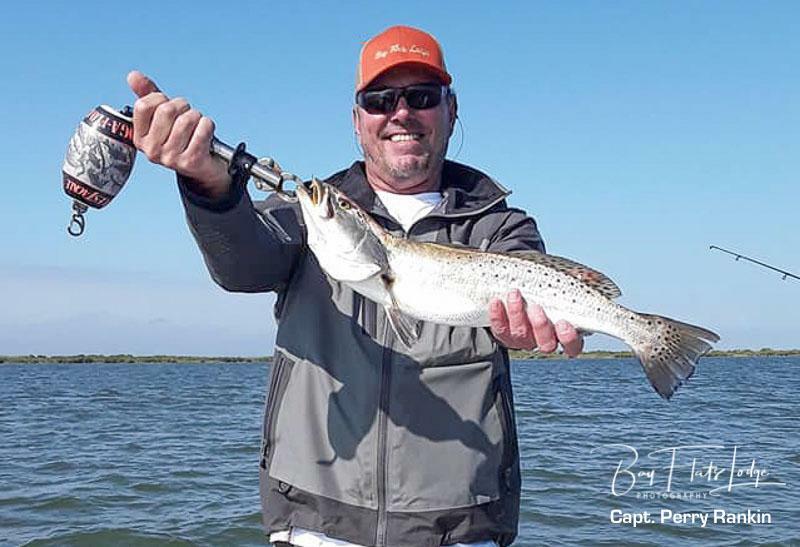 If you’ve been waiting for a break in the summertime heat before coming down to the coast to fish, then you should start packing for a September trip. We’re already seeing temps in the lower 80’s, and we should expect even a little cooler weather later in the month. It’s at this time in the year when the temperatures will begin to slowly drop allowing for milder conditions all along our coastal regions. The waters shall begin their greening process, and some of the season’s initial flights of ducks should start arriving from the upper states. The beginning of autumn will soon be upon us, and you’ll need to be ready. 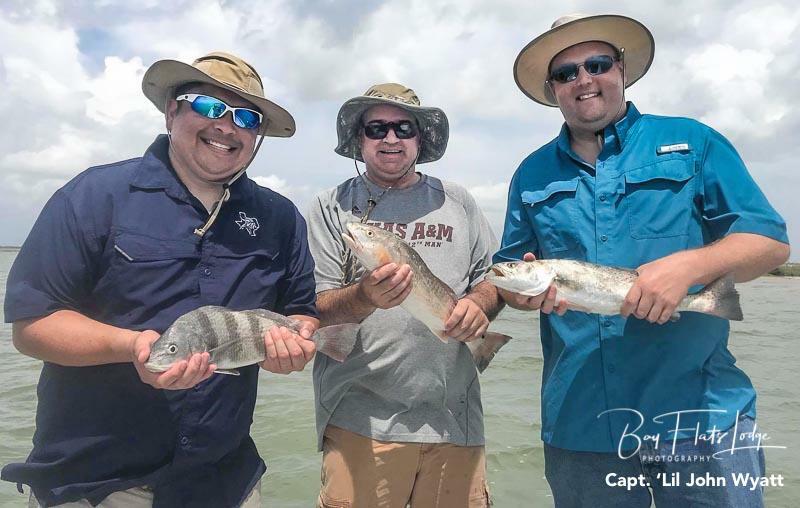 With higher tides already taking place, Coastal Bend anglers should start looking to the various back lakes on Matagorda Island and to the shell reefs of San Antonio Bay to start producing some of the year’s finest trout action. As for the reds, you might start searching for them in Guadalupe Bay, looking for sand pockets and pushes (wakes) rather than tails. Recent rains have already cooled the water a bit and the reds have reacted quit positively. Maintain your standard summertime routine of starting early in the morning and starting out in some really shallow water. For the pluggers amongst us, some of the year’s best top water action will soon begin, so start each day tossing small surface walkers like the Skitter Walk Junior or the Super Spook Junior. If they’re not hitting on top, try throwing some plastic tails rigged on either 1/8 or 1/16-ounce jig-heads. Absent of any unexpected tropical weather, area bay waters should remain in good shape, so try some of the more brilliant tail colors until you find one they like. Have fun out there, and be safe! While on a Wednesday scouting session, I dialed-in several areas that needed to be investigated, especially with the bull tides we’re seeing right now. The top water bite was more of the “slap, swing in a miss”, so it was necessary to work the other portions of the water column. Interior back lake drains with swollen tides gave up scores of trout while working 6-inch Gambler flapp’n shad chicken on a chain tipped with 1/8 oz. screw lock jig heads. While scouting sandy shorelines in other areas, I found shrimp jumping nervously out of the water 100-150 yards off the salt grass, which resulted in fast-paced trout action. Norton tequila gold sand eels rigged on a Norton screw lock worked best. 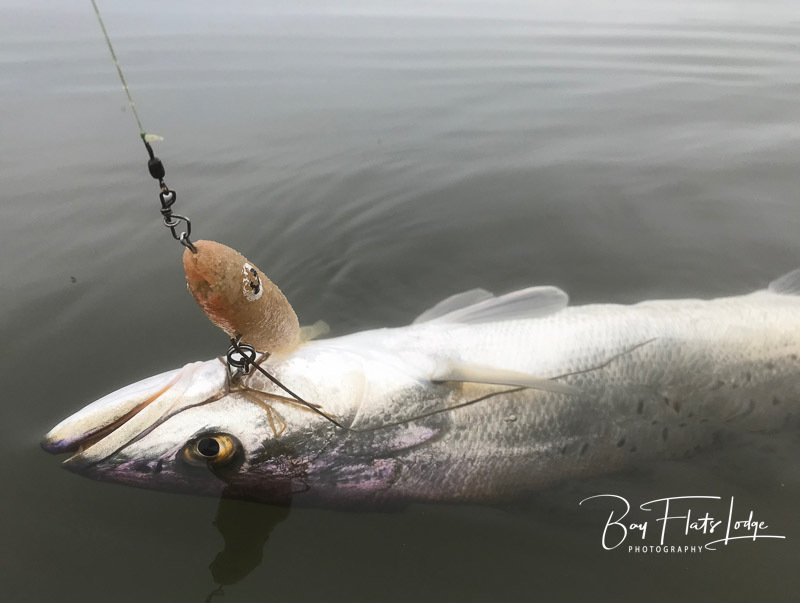 The best lure action was away from the shoreline and was a slow, but steady, retrieve – it felt like a heavy weight on the lure, or a slow pull on the line. I hope this helps! Capt. Stephen Boriskie – Today was day #2, but it was a shorter day for these gentlemen. They had just as much fun, however, catching today as they did yesterday. Before we called it a day, one of the guys hooked a Gar on a live shrimp on a croaker hook. Imagine that! Anyhow, it was an interesting ending to a couple of fun days on the water with good people. We’re really looking forward to the fall season and the fall fishing pattern – it can’t get here soon enough! Capt. Jeremy McClelland – We have had some great fun the past few days with customers from age 6 to 60 – everyone’s been getting in on the action! 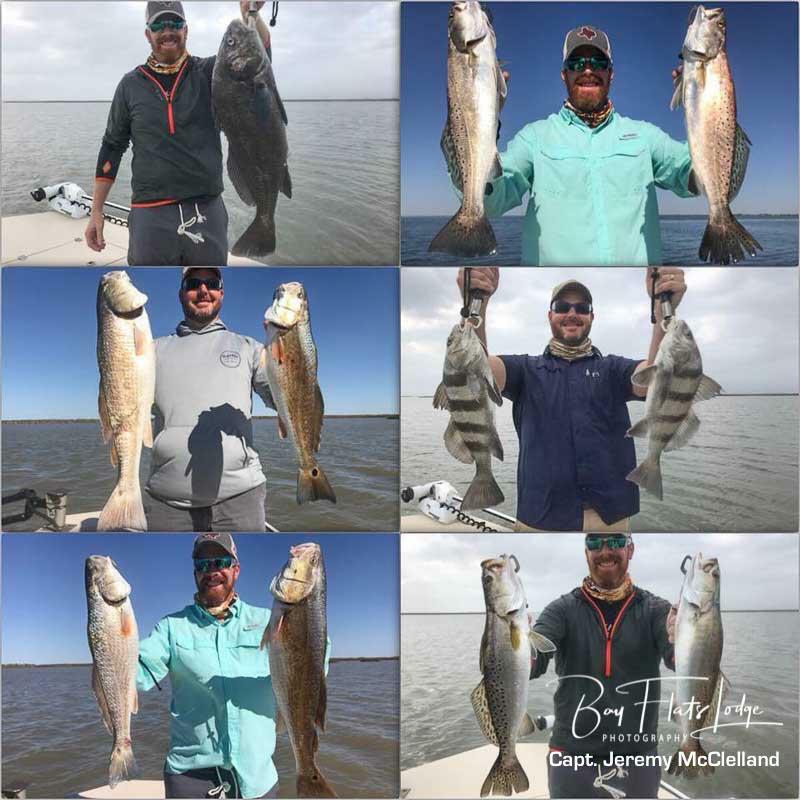 The fish have been cooperating for the most part, with the most recent activity coming from the Redfish and the Black Drum. The trout are here, and in numbers, but many times we have to go through quite a few before we locate a slot fish. But that all seems to change from day to day, as well, because the other day some of our guests found numbers of nice size trout, even a couple of “Bigs”. Once this heat is broken for good, and the fall pattern sets in, we’ll be looking for greater numbers of larger trout. I can’t wait! Capt. 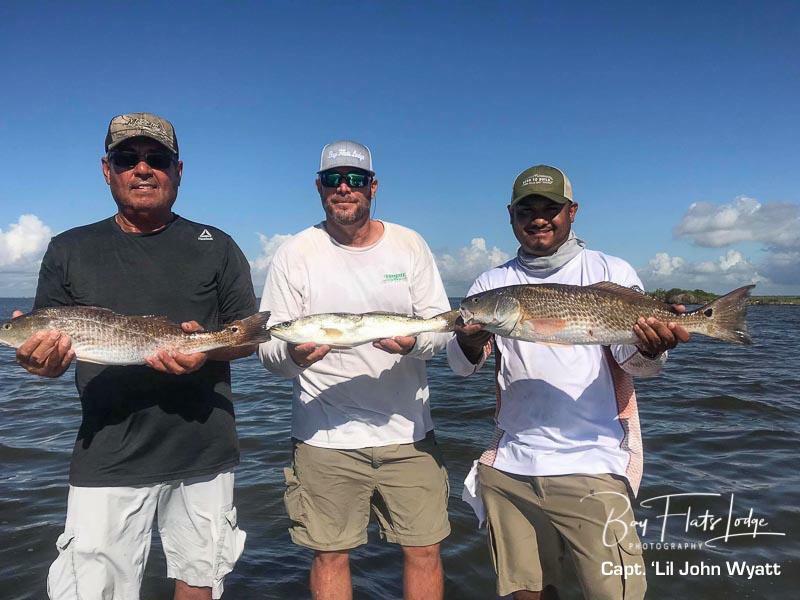 ‘Lil John Wyatt – I have been fishing with different groups the past few days, and the fishing action has been nothing but steady! If things continue at this pace, we’re in for a great month of fishing in September. 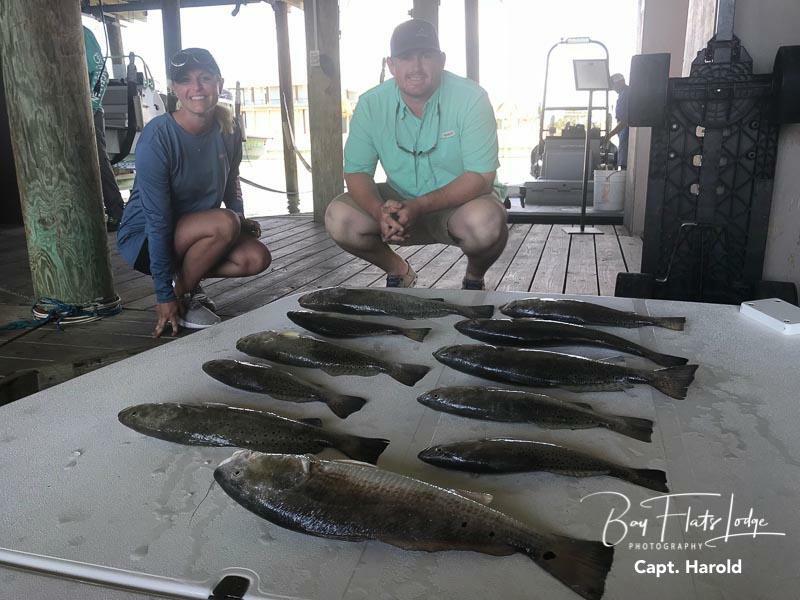 We’re seeing Speckled Trout, Redfish, Flounder, and Black Drum almost daily. We continue to swap between croaker and live shrimp, but the results have almost turned out the same regardless of the bait. As they bay water starts cooling a little bit later this month, we’ll start fishing more over grass and mud. Fall is always a transition worth waiting for around here – the weather cools off, and the fishing heats up! Get ready! Twice a year, at the September equinox and the spring equinox, the earth’s equator is aligned with the orbital plane of the earth around the sun. This is when we experience extremely high tidal ranges that generally peak in September, October, and sometimes even into the early part November, with the absolute highest tides occurring a day or two after the full or new moon nearest to the equinox. 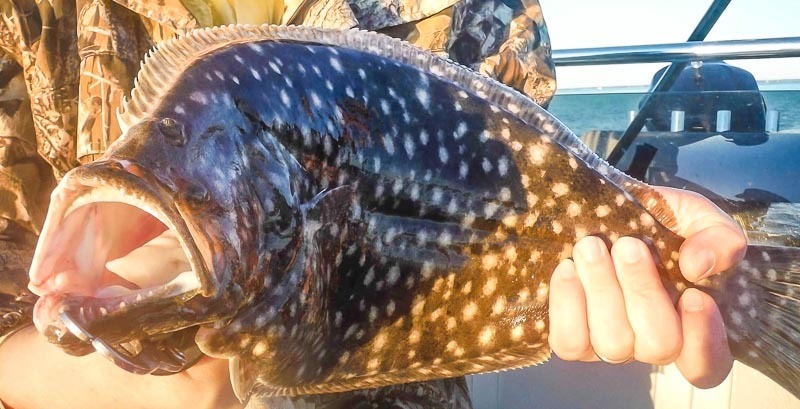 This is good news for us because favorable fishing conditions commonly exist around higher tides, specifically in coastal marshes, and especially following such extreme slack-tide conditions like those we’ve had here during the last part of the summer. The trout, redfish, and flounder will suddenly all be able to go places that were previously unavailable to them. 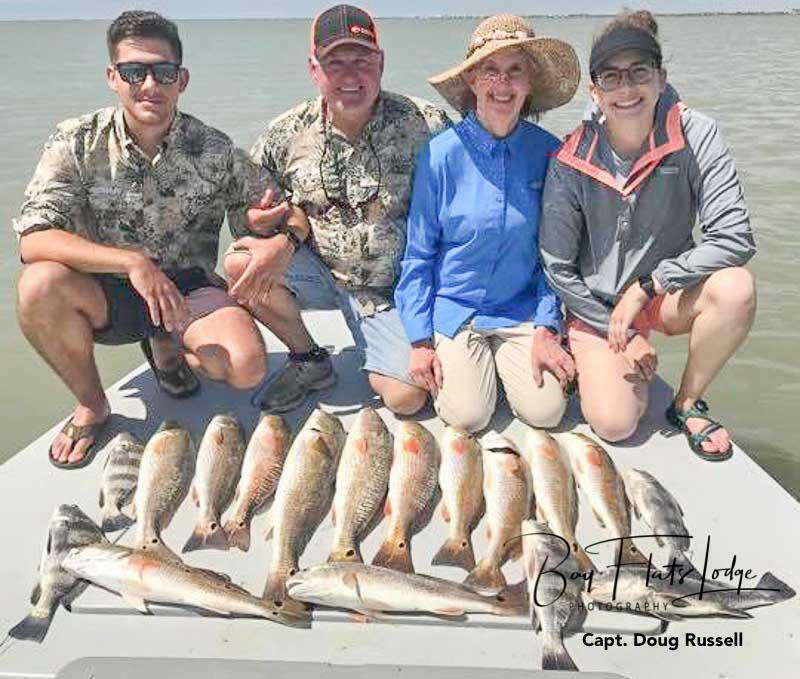 The trout, and particularly the redfish, will once again start looking for food on outgoing tides, tides that will dump an assortment of food out of the grassy areas and upon adjacent flats. When this happens, anglers need to be ready to take advantage of some of the hottest action of the year. Toss top water baits for trout during the first hours of light, but later switch to soft plastics, working them slightly above the bay floor. While wade fishing for the trout over grass, place your focus from the middle to the outside edges of the grass, as you’ll often find larger trout to be just on the outside edges where there’s sand. Capt. Stephen Boriskie – What a fabulous day with great new customers in the hauling business – crude, fuel, you name it, they do it! 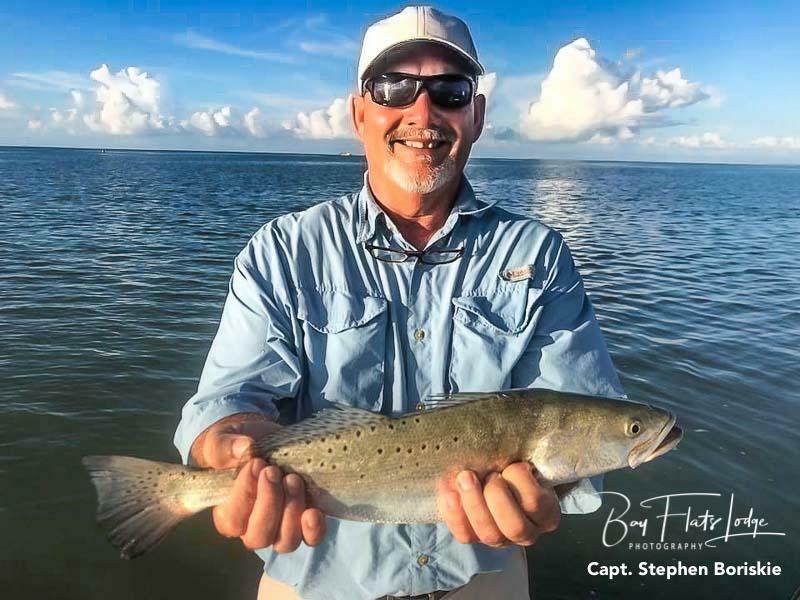 Welcome to Texas, and to Bay Flats Lodge, and we hope to host your groups again. Capt. Billy Freudensprung – Side-splitting day from laughing and catching with Bo, Bruce and Eric today. These guys kept me rolling all day long, and they were none too bad with the fishing rods either. They filled the box today with trout, redfish, and black drum, and they had a great time doing it! Capt. 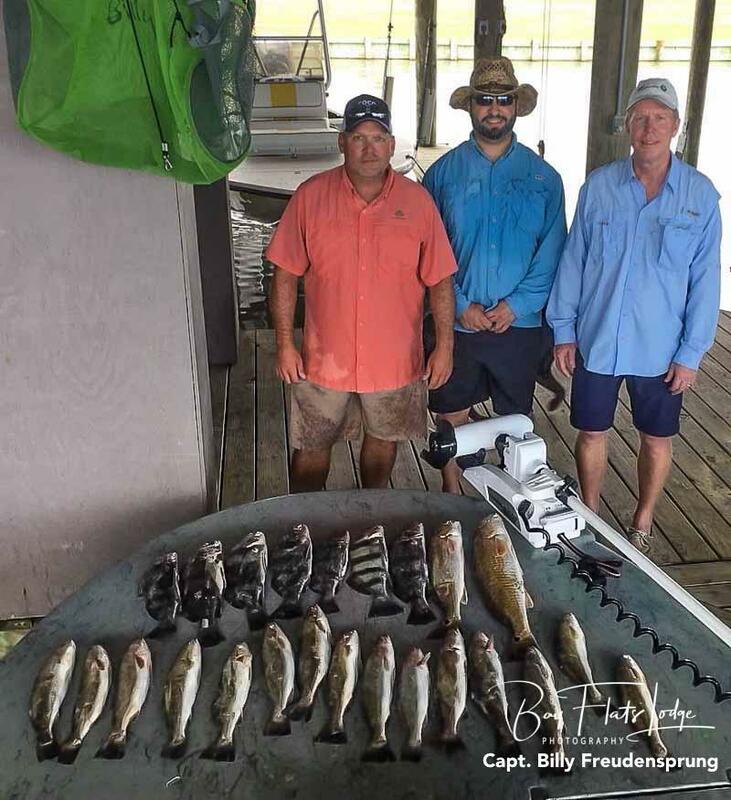 Stephen Boriskie – Relief from the scorching heat all morning as we dodged storms and rain and enjoyed the cloud cover, and we were able to box a three-man limit of Speckled Trout and a bonus Redfish. September is looking good right now, and we hope the good fortune continues without the threat of tropical bullies. God bless and happy Labor Day weekend! Capt. 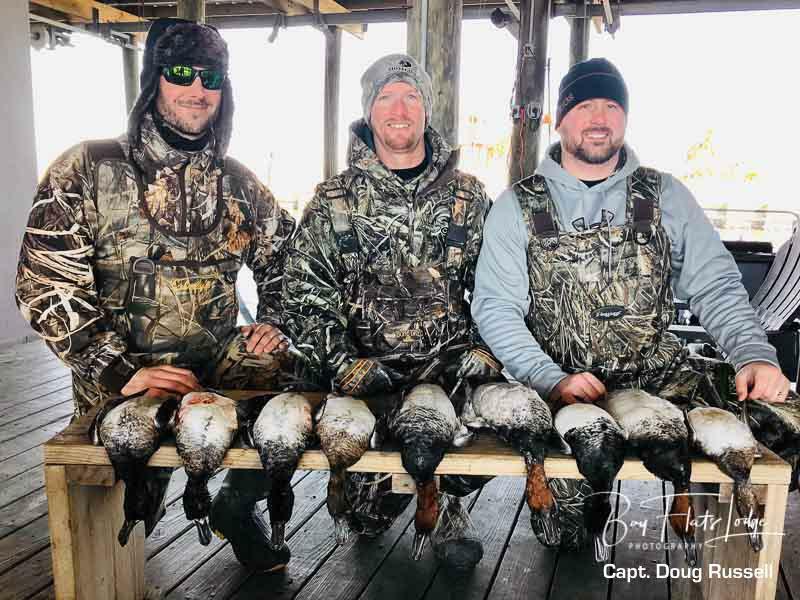 Doug Russell – Getting kids addicted one at a time! 12 year-old Holly got all she could handle today, and her parents and I enjoyed watching the show! 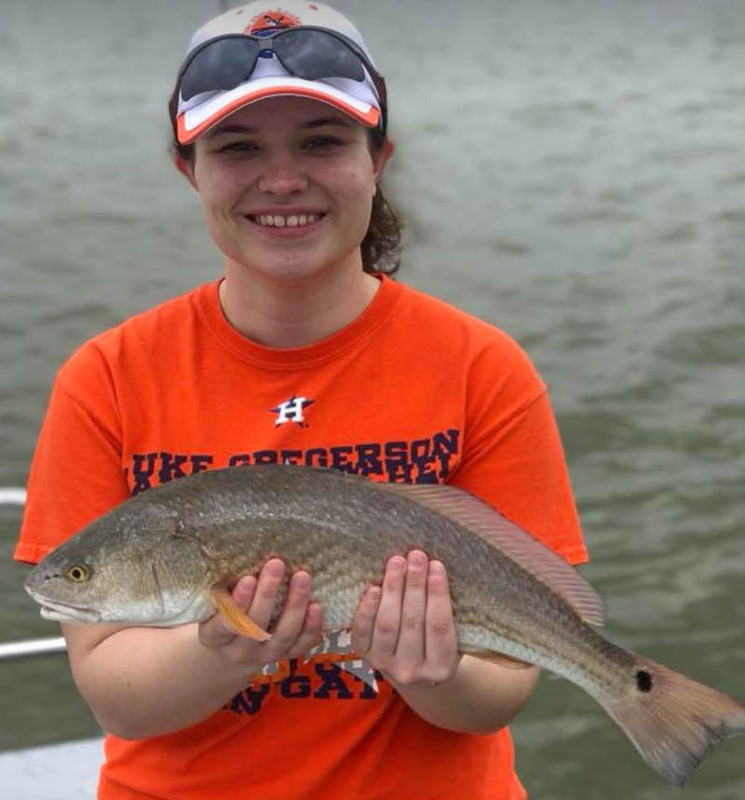 There’s absolutely nothing more fulfilling than seeing kids enjoying the sport of fishing, especially in such a special place as our own San Antonio Bay system. We made it through June and July this year without being scorched to death, but the sun Gods really strapped it to us in August. We didn’t have much precipitation to speak of, and bay water temperatures almost matched that of the air temperature around here. But if there is any truth to the old adage that history does repeat itself, then September should begin to show us a cooling trend toward the later part of the month. That’s right, September marks the month on the Texas coastal calendar when Mother Nature finally considers turning down the heat in her summertime oven. We’ll look this month for the Coastal Bend region of Texas to receive this year’s first notable cool front that should, in turn, provide some badly needed rainfall across the state, and to drop daytime coastal temperatures down into the 80’s. Even if it’s not for but a very brief few days, it will be greatly appreciated by all. We should also be able to anticipate some cooler water temperatures and less sunshine as a result of a possible increase in cloud cover. In addition to a cooling climate, another transition also begins taking place this month. It is in September that we routinely begin seeing a gradual rise in the daily tide levels as we work our way toward October. 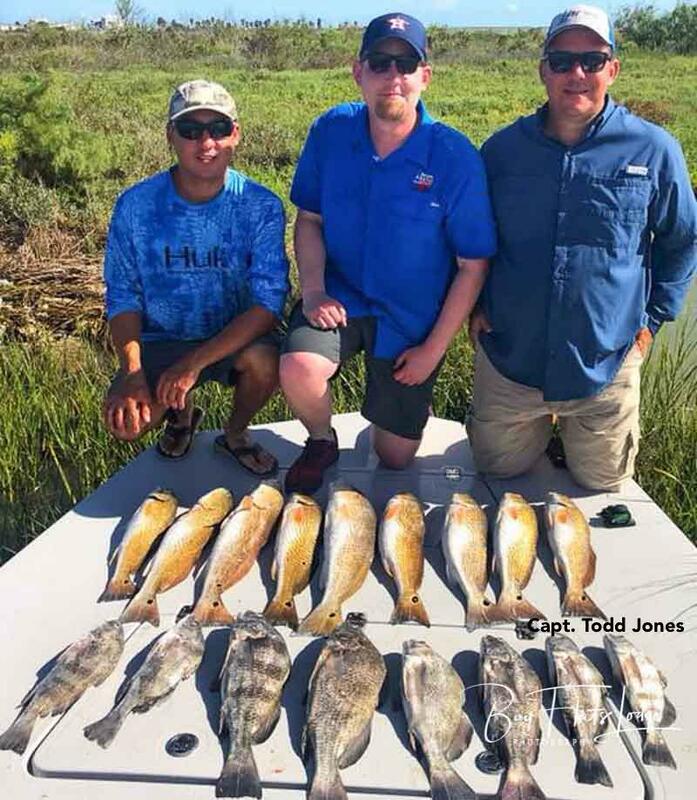 Because of this, anglers should start looking for September trout and redfish in many of the area back lakes as the higher tides become more prevalent, starting early each morning in shallow water with small top water baits and then moving to deeper water while throwing soft-plastics as the surface bite diminishes. 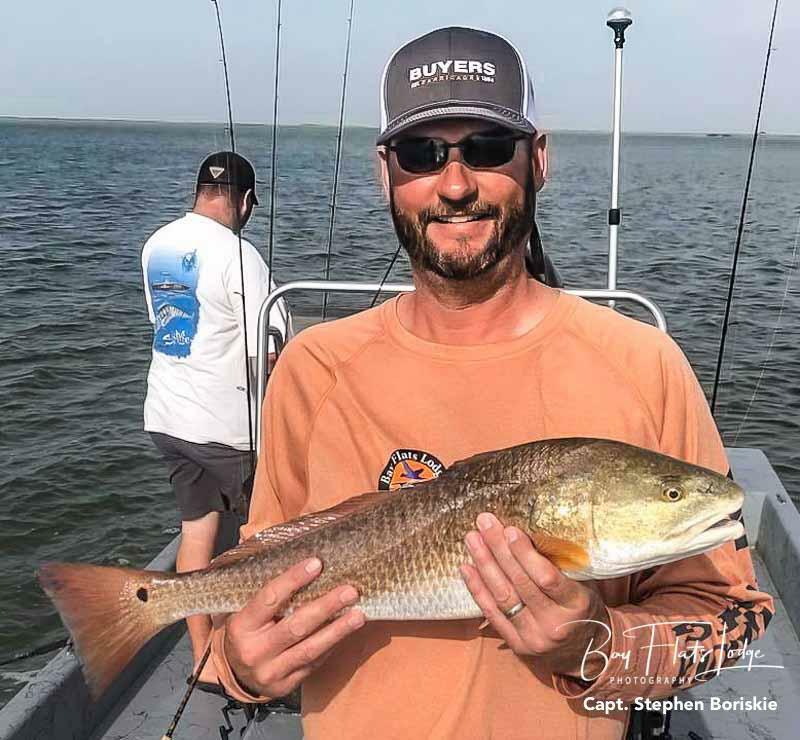 Lately, anglers have located the red bite over soft sand and mild mud, with an occasional mixture of shell provided as structure – key ingredients that can all be found in our back lake areas. Recurring mild and brief northern frontal passages along the Texas coast throughout the month of September will not only signal moderate drops in temperature, but also of modest conditions that influence the ever-popular greening effect upon our Texas coastal waters. With the approach of autumn beginning this month, we might very well be looking forward to what could possibly become some of this year’s most remarkable fishing to-date. I hope you’ll join us as we look to enjoy some of the benefits offered by cooler conditions, and the rewards of some heated September action. Good luck, and keep grindin’! 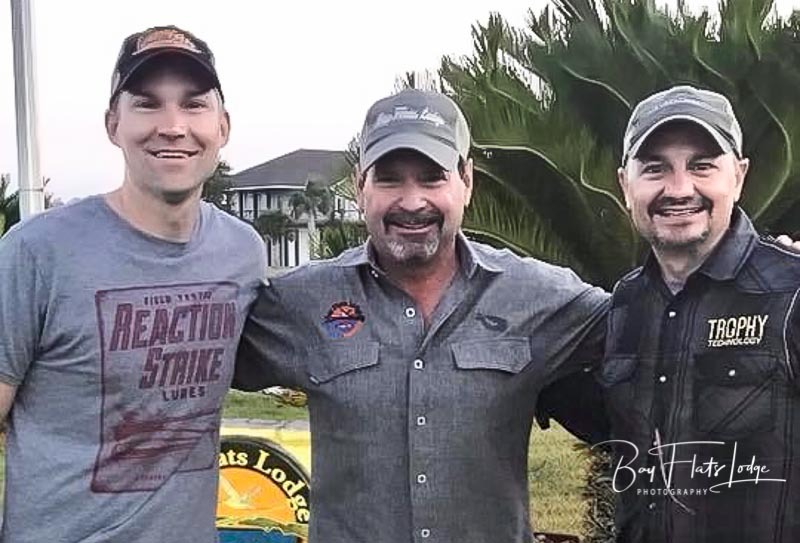 Aside from being two terrific men, Jay Madden and Scott Head are the owners and operators of Trophy Technologies, Inc. Trophy Technology has been with us here at Bay Flats Lodge the past few days filming two future shows. Capt. Harold Dworaczyk and Capt. 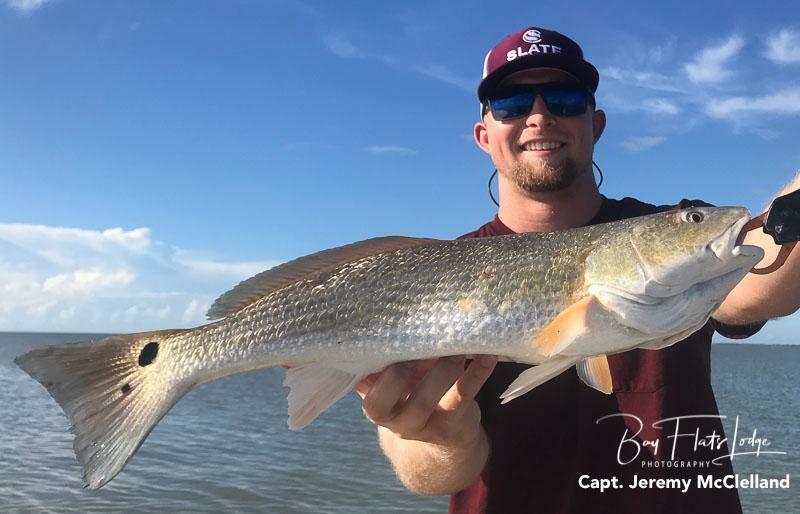 Cody Spencer of Bay Flats Lodge acted as hosts and fishing guides, as well as general lodge experts. 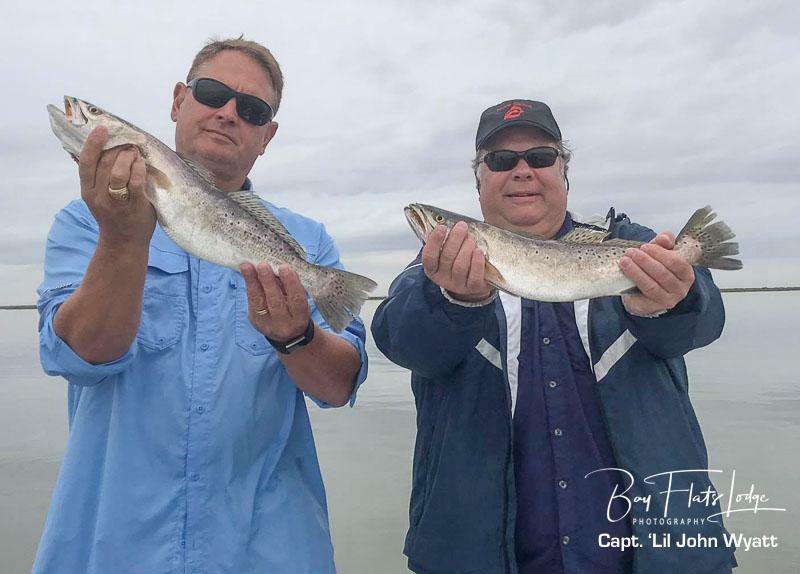 You can look for the Bay Flats Lodge episode of Trophy Fish Hunter on CBS Sports Network in the first quarter of 2019. Capt. 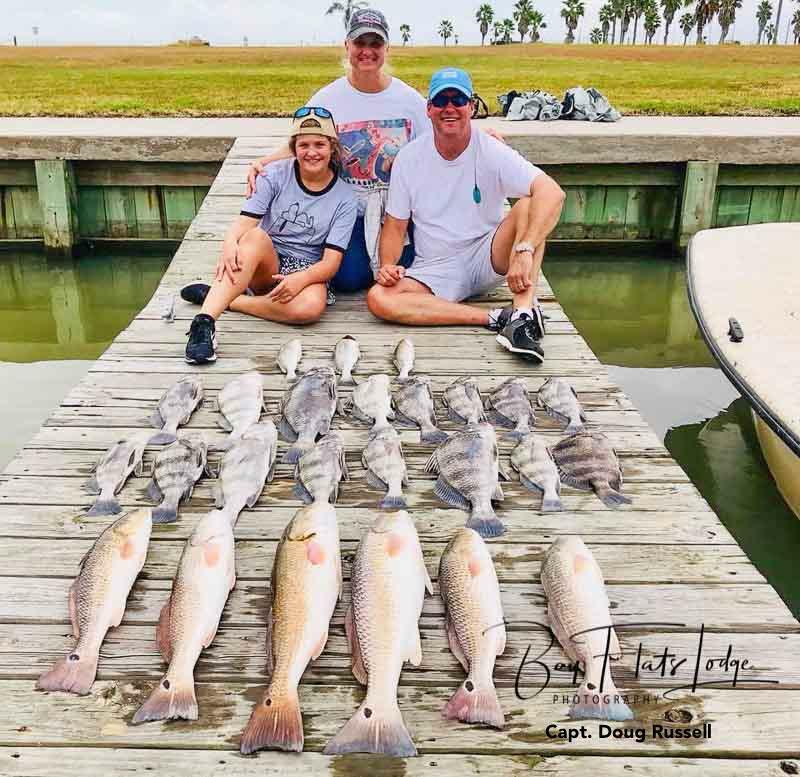 Todd Jones – Family fishing trips always seem to be the most fun, especially when you have a good day of catching. Returning customer Doug got the chance to bring his family down for the first time. His wife Helen, son Daniel, and daughter Nicole enjoyed a rare day on the water together. It was a slow start, but they kept the grind going until we finally got on a solid, fast and furious bite after lunch. It was fun to be a part of all the smiles and laughter. Hope to see all of you again very soon! Capt. Cody Spencer – Today was Day #2 with this group of three friends that made up the Rusty K. party. Yesterday presented us with rain and a slow bite, so we were hoping for a much better day today, and that’s exactly what we received. The guys had steady action all day long while catching speckled trout, jack crevalle, and even shark. It turned out being a very interesting trip with these guys from the Smithville area! Hope we’re able to do it again soon! Capt. 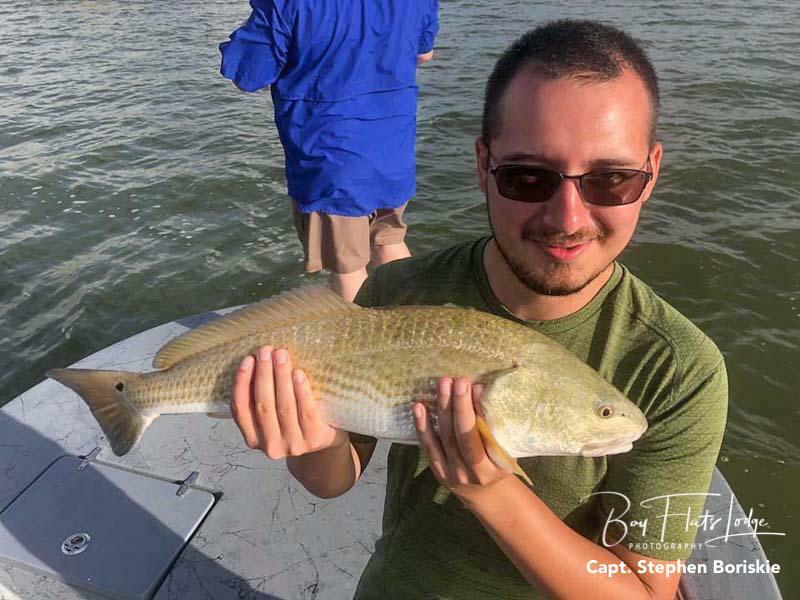 Stephen Boriskie – Thanks to Mike C. who has trusted BFL multiple times each year over the past decade by bringing his 20+ customers each time for a more personal and relaxing way to talk business, and to catch fish at the same time. Old school ways of doing business are sometimes the best way! Take Brian here, for example, shown holding a 27.75″ redfish that he landed today. Add to this today’s near limit of hard to find speckled trout and you know why these guys return time and time again. We are approaching one of the most productive times of the month, and the year, so get on the books and make the short drive from almost anywhere in Texas. 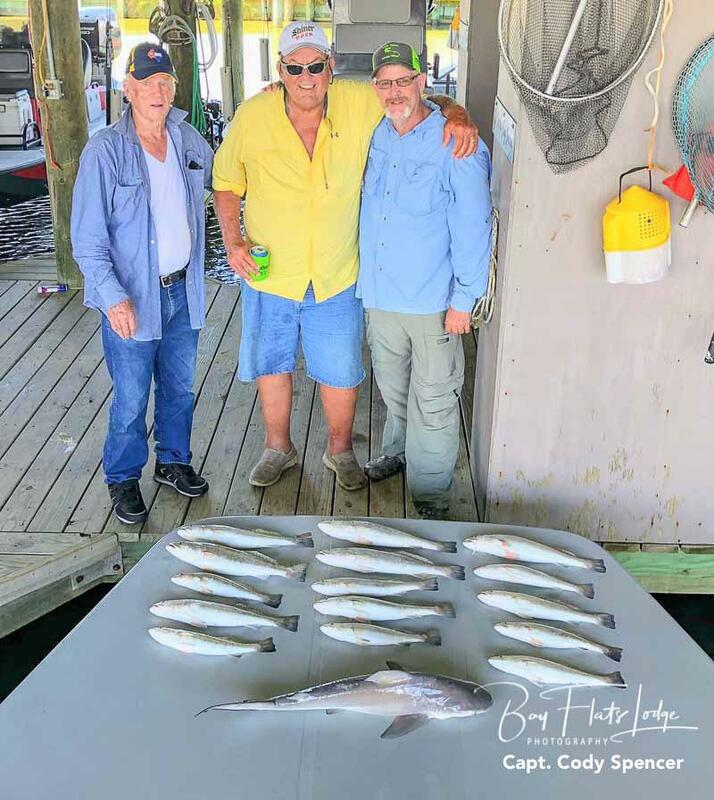 I have plenty of dates open for you and your guests, so call Angie or Randy at 1-888-677-4868 to get your fishing trip of a lifetime booked now!